StarCityGames.com - Announcing The Complete Commander! I've been alluding to a big announcement for a month or so now, and I'm super stoked to finally I get to reveal it today. The big announcement is . . .
John Rizzo and I have been tapped to write the screenplay for the big Magic: The Gathering movie! Oh wait, that's just me daydreaming. Hollywood certainly isn't going to get anyone to write the script that actually plays Magic! Silly me. Rather, the big announcement is . . . 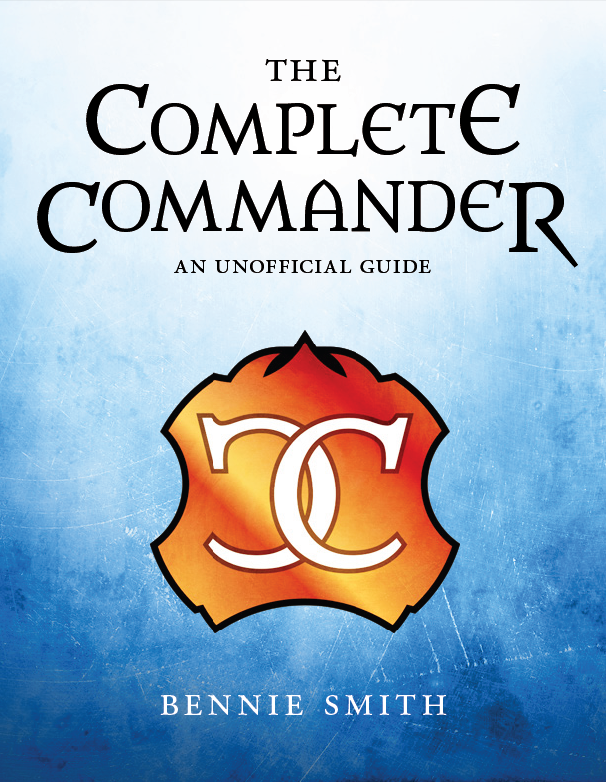 I've written a book called The Complete Commander, and it's available to purchase as an eBook right here right now on StarCityGames.com! How exciting is that? Well, for someone who's always hoped one day to be an author, having my name on a book is a dream come true. I've written millions of words about Magic over the years here at StarCityGames.com, over at MagicTheGathering.com, and in even in print for Scrye Magazine, but let me tell you, putting out a book with my name on it feels "next level" good! I want to express my gratitude to Pete Hoefling, Evan Erwin, and the gang at StarCityGames.com for offering to sell the book here and promoting it. Tell Epic Magic Stories With The Complete Commander! So you may be wondering what The Complete Commander is about. I started with the idea of updating my old EDH primer series that I wrote nearly five years ago. That series and others I wrote to help beginning and intermediate Commander fans get up to speed on this incredibly fun format were well received when I wrote them, and I still get emails and messages from people saying that they find them helpful even now and have kept links to them at the bottom of each column I write. But five years is a lifetime in Magic, and EDH/Commander has exploded in popularity since then. Wizards of the Coast has many Commander fans within its walls, and they've made a lot of cards with Commander in mind since then. I got the motivational push I needed when Commander 2013 was announced, the second batch of products designed specifically for the Commander format. The initial Commander product was a huge hit and gave people a great way to jump into the format, and Commander 2013 was sure to be even bigger. The excitement level for Commander was going to get a boost, and I knew that if I were going to update the primers now was the perfect time to do it. But how exactly does one go about publishing a book about Magic? There's not exactly a ton of them out there, and the ones I could easily put my hands on—Patrick Chapin's Next Level Magic and Michael Flores' The Official Miser's Guide—were strategy guides geared toward high-level competitive Magic play. I suspected that the target audience for those books would generally be different from the target audience for a book about Commander. I felt the new primer needed to have a visual style and content flavor all its own geared toward Commander fans and potential new Commander fans. To help sort through this, I reached out to my good friend MJ Scott. Some of you may know her from her columns over on GatheringMagic.com or her own blog at www.moxymtg.com where she does some kickass Magic fanfic. She's one of the popular advocates of the "Vorthos" side of Magic; she does card alteration, dabbles in cosplay and has done some freelance work for Wizards of the Coast. She's a talented artist and one of the best writers I know, and I was positive if I could get her to help me this project would be a success. Thankfully she wasn't just willing to help me—she offered to be my partner in this project! Most books have an editor, but after we started working together I thought she also deserved the title of producer. Not only did she edit all the words that went into this book, but she was a project manager, a networker, and a motivational coach. I couldn't have asked for a better partner! Her first move in this endeavor was a home run—she recruited James Arnold to do the layout and design of The Complete Commander. James is a graphic designer and illustrator who also loves Magic and is a huge fan of Commander, so he was a perfect fit. He does stellar infographics over at GatheringMagic.com and has his own website thatguyjames.net where he does some truly breathtaking work jazzing up the images of iconic Magic legends. Any Commander fans should definitely go check out his work. James took the notions that MJ and I cooked up for the visual look of the book, added his own ideas, and gave us something that is truly beautiful to look at. His hard work and can-do attitude was inspiring, and you can see it in every page of the book. MJ also suggested that we reach out to people in the Magic community who love Commander and see if people would be willing to help pitch in to make this book even better, and I'm proud to say that we got great response. I knew a must-have was Sheldon Menery, the godfather of Commander, and am pleased he wrote a sweet foreword for the book! We also got Mr. Command Tower himself, Adam Styborski from MagicTheGathering.com, to write the introduction. Robby Rothe writes an amazing blog on Magic design at MTGColorpie.com and is a huge fan of Commander, and he contributed a real tour-de-force to the book on how legends were designed over the course of Magic's history and how the popularity of EDH and Commander changed the way legends are designed now. Fans of Commander are going to love reading these parts of the book! Of course, the bulk of the book is an update to my primer series designed to get someone who knows little to nothing about Commander up to speed on the format in no time. When I first wrote the original primers (you can find the links at the bottom of my columns), I just wrote a loosely organized bunch of tips I thought people could use on learning how to play the format. There wasn't really a coherent theme to it other than just showing people how to play, but in the years since I wrote those articles my understanding of Commander has deepened and changed. My new perspective on Commander galvanized when I wrote The Hero's Journey here on StarCityGames.com. I realized what's truly amazing about Magic—and Commander specifically—are the stories you can tell with the cards you choose, the plays you make, and the people you play with. When I approached the task of updating the primers for this book, I did it with that perspective in mind, and I think it makes The Complete Commander a much better read. I cover a lot of bases here: why play Commander, the rules, choosing your commander, deckbuilding for Commander including a full deck brewing walkthrough, and three chapters featuring different commanders with three different approaches to building decks including budget-minded starter kits and sample decklists. Be sure to check out the minisite for the book, where you can see a seventeen-page preview of the book to get a good idea of the sweet stuff you'll find inside. I thought it would be fun to include some Magic fiction as well tied to the specific commanders featured in the book. There has been a ton of great fiction written about the Magic universe over the years but relatively little that's geared specifically to bringing the special rules and gameplay of Commander games to life. MJ went out and recruited some great writers to do just that, and I'm proud to say John Dale Beety, A.E. Marling, Andy Rogers, Ant Tessitore, and Natahlia Lysse Zaring wrote some great Commander stories for us. MJ Scott and James Arnold even pitched in some great stories of their own! Any fan of Commander knows the best part of the game are the huge and splashy haymaker plays that are only possible in Commander, the sort of plays that inspire stories you love to share with other players for years to come. MJ came up with a cool idea of including these sorts of stories in the book, and we sent out a call for fans of the game to share their most awesome stories. We got a great response from the community, and I'm pleased we were able to share a bunch of them in the book. We called these "Spirit of Commander" vignettes, and they tie off each chapter, punctuating what is so cool about the format. You may find one of your local Commander friends wrote a story that's in The Complete Commander! To round out the content, we got dynamic duo Renee Hupp and Trevor Gulley to write a Magic 101 appendix to the book. Renee writes for MTGBroDeals and Trevor blogs about gaming and such. Even though I anticipate most people interested in buying the book will already know how to play Magic, MJ rightly pointed out that there might be people who get interested in playing Magic by watching friends play Commander and they'll want to learn the game specifically to learn how to play Commander. Magic 101 does a fantastic job covering all the bases on Magic gameplay for those just learning to play the game. I've also included an appendix filled with Commander "staples" sorted by color and casting cost, so if you've got a few holes to fill in one of your Commander decks just flip to the back and you'll find something solid to drop in. I could go on and on, but I think you get the point—this book rocks! MJ and I have also created a webpage called completecommander.com. Its main focus is to highlight the book and point people where they can buy it, but we also want it to be a home for expanded content that builds on what's in the book. Periodically I'm going to feature deck walkthroughs like the ones I do in the book, and if you like the Commander fiction found in the book, I hope to have more of it on the website as well. I'd like it to become a hub where Commander fans can come to find information about Commander as a format and have included links to great Commander content around the web. If anyone is looking to start building their resume managing a small Magic website, get in touch! Copy and Clone cards are super popular in Commander because there are always sweet creatures out there you want to copy, especially with the new legend rules where everyone can have their own copy of a legend. There are quite a few cards out there that use tokens to designate a copy, yet a "copy" token has never been printed, so I thought that would be perfect to promote The Complete Commander. 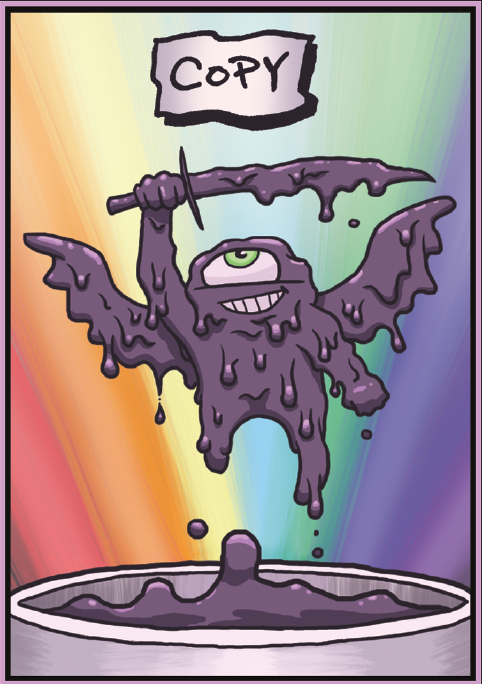 Inkwell Looter's art does a great job capturing the copy token made from Mimic Vat, a popular Commander card, but you can obviously use this for any copy effect. While supplies last, if you see me at any Magic event, ask me about the token cards and I'll give you one! I'll be at Grand Prix Richmond all three days March 7-9, so if you're coming down for this sweet event look me up. If you live on the West Coast and run into MJ Scott, she might have some too. Some of you may be wondering if there's going to be a paper edition of the book available. The answer to that question is . . . it depends on the Magic community. If there appears to be demand for it, I'd certainly love to do a print edition with expanded content, so we'll have to see what the people say. Definitely let me know what you think. If the demand is out there, I also anticipate having additional The Complete Commander products featuring advanced strategy guides and maybe more fiction. My vision for The Complete Commander is not just a single book but a brand we can build upon and add to the family. As the Commander format continues to grow, I'd like The Complete Commander to grow with it. If you have any thoughts or want to contribute, get in touch! But enough gazing into the future. Right here right now we've got this sweet eBook featuring tons of stuff from me and the Magic community that I think you're going to love, so go check it out!